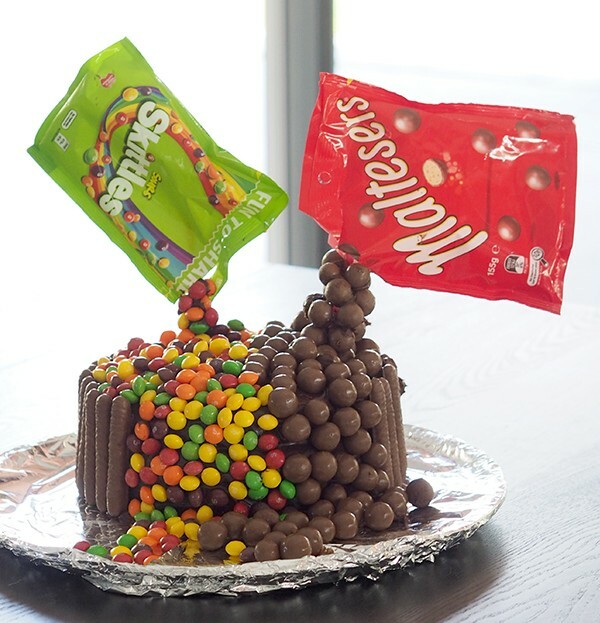 I made a chocolate gravity cake for Mr 13’s birthday party. 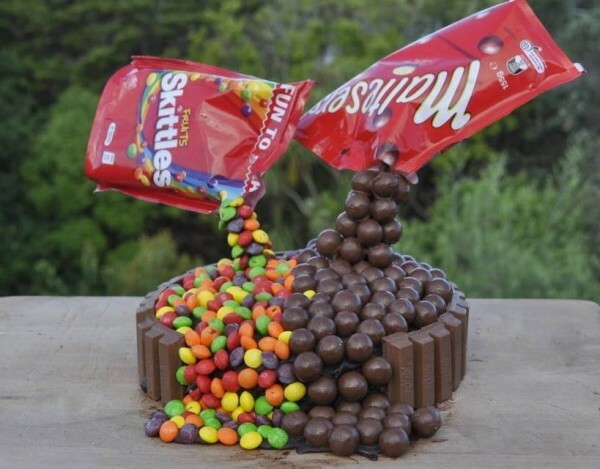 He LOVES skittles and anything sour so I used them, rather than the popular M&M’s I have seen on other cakes. 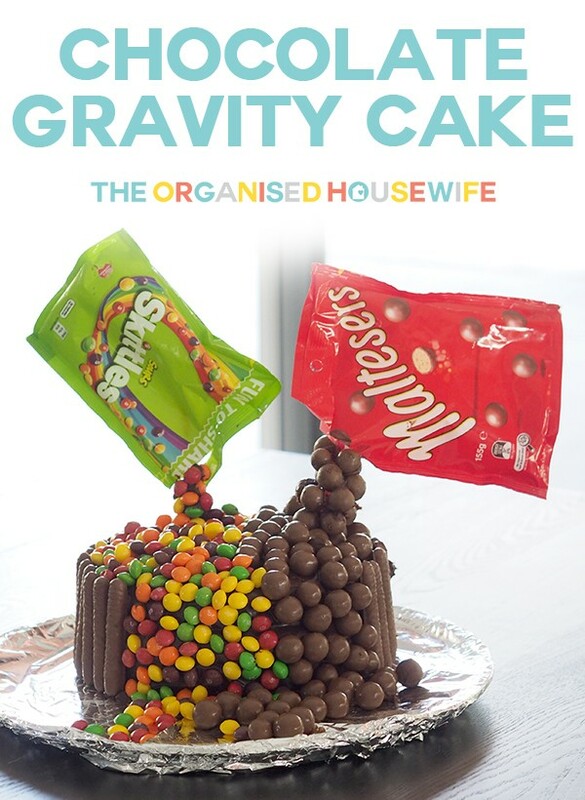 I’ve also added some found more gravity cakes, which I shared below to give you design idea. I did have to rush this cake in the end as I had to run to school in between putting this together to pick up a sick little miss from school. All in all though Mr 13 and his mates thought the cake was AWESOME!! Make cake and separate evenly into two pans…. as you can see I didn’t do it very evenly LOL. I used this Chocolate Slab Cake recipe. 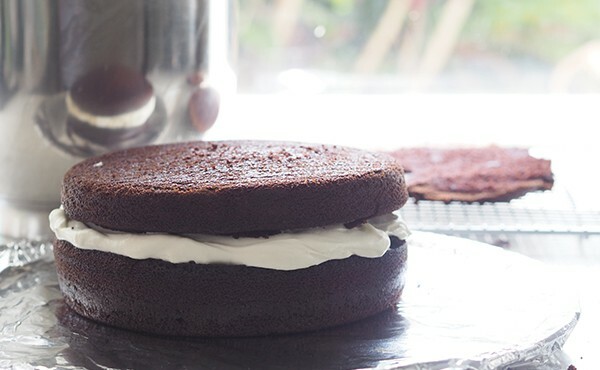 Once the cakes were cooled, I removed the top of each of the cakes to make the layers flat and then added some whipped cream between the layers. Ice cake, over top and sides. Leave some icing to add lollies to the straws to look like they are falling from the packets. Directly after you have finished icing the cake add chocolate finger biscuits around the side. I used Coles Chocolate Finger Biscuits, I had a hard time finding these, my local Coles didn’t stock them, so I went to a Coles in a major shopping centre, thankfully they had them. They were the right height for a double layer cake. 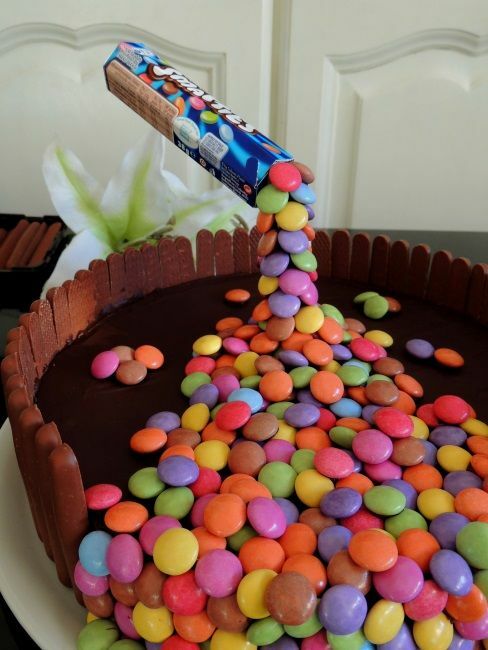 Leave a section in the front with no fingers, so the lollies can fall down the cake. 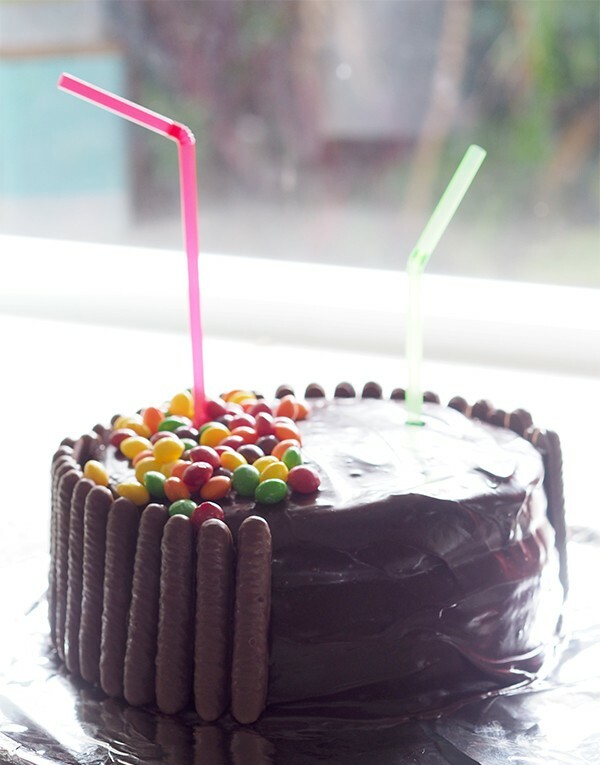 Place 2 different sized straws into the cake to hold the empty packets of lollies. Put your desired lollies or chocolates on each half of the cake, use the left over icing to stick the lollies to the straws. 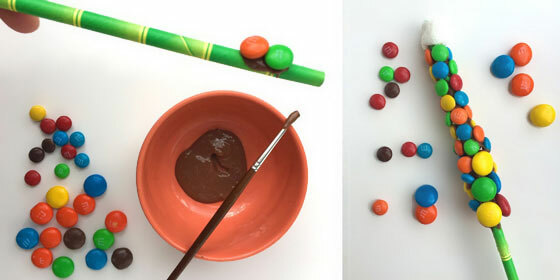 Happythoughts show a great idea of brushing chocolate onto a straw with a little brush, then add your lollies. Then gently place the packets over the straws. I used 1 and a half packets of each lollies/chocolate. Note: think about which side you are opening the lolly packets so that it sits correctly on the straw. ie. I opened the skittle packet on the right and Maltesers on the left. 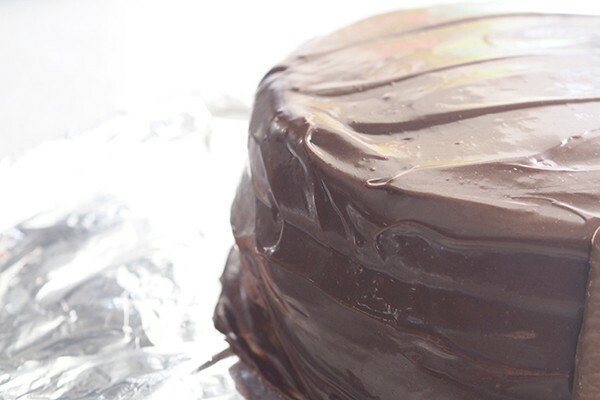 A sweet gravity cake with sprinkles and chocolate drizzled over the side. Find step by step instructions from Hobbycraft. 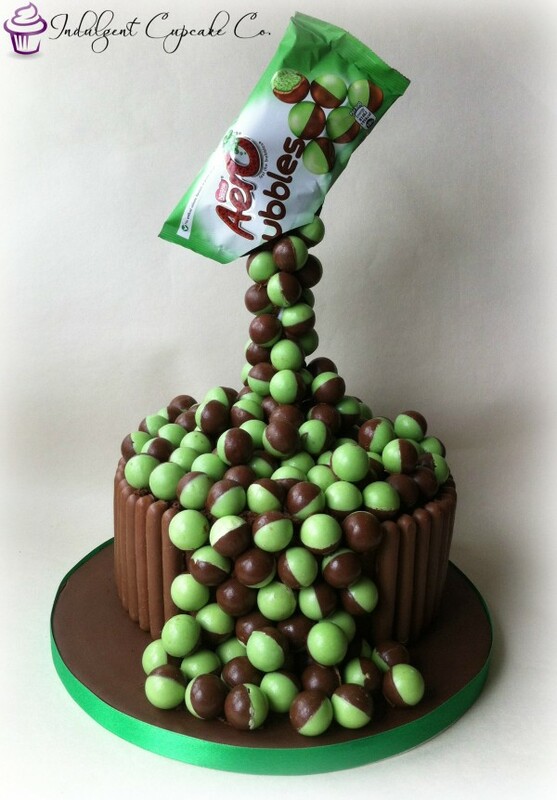 Gravity Cake with Aero balls, image credit Indulgent Cupcake Co.
Kelly from Be A Fun Mum made a similar cake, but with Kit-Kat’s around the outisde of her one layered cake. 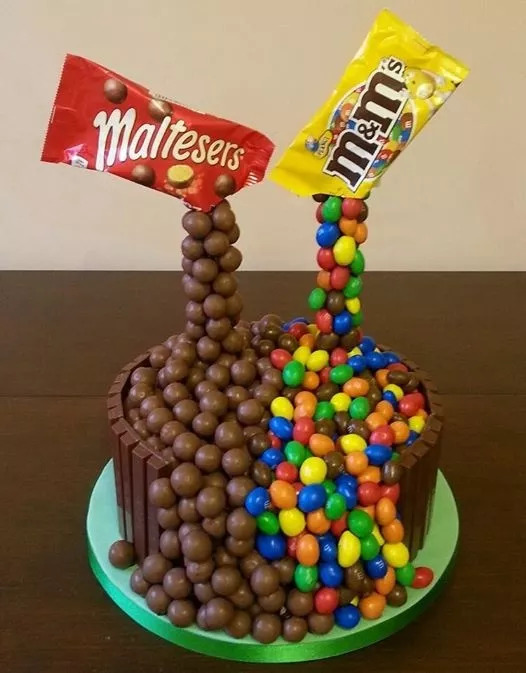 When researching design ideas most of the gravity cakes used Maltesers and M&M’s like this one from CakesDecor. 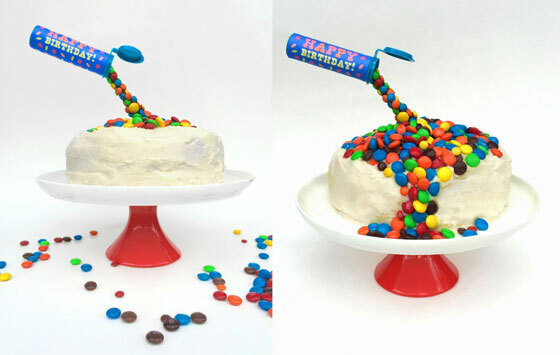 Happythoughts uses a tube of M&M’s to decorate the cake. Use smarties, original image credit unknown. 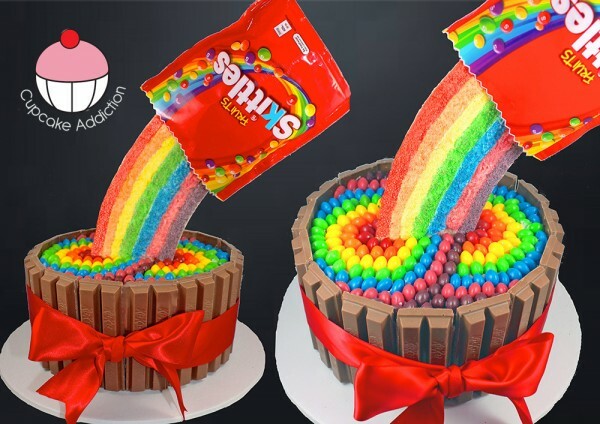 This rainbow Skittles Cake from Cupcake Addiction is amazing! 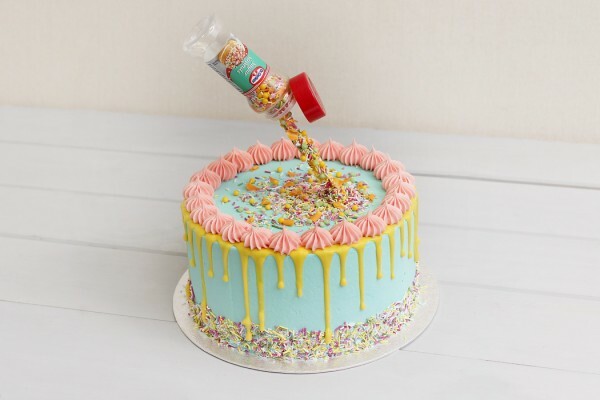 I’ve done one of these cakes but used one of those long round wafer sticks (that come in the round tins around Christmas time) instead of a straw. A bit stronger and edible! clever thinking, and it’s edible too!!! Oh that’s even better! My daughter loves those! She’s enthusiastically confirmed that this will be her 18th birthday cake! Oh Kat – these look A-M-A-Z-I-N-G !! I had never heard of a gravity cake before. That’s why I love your blog – I ALWAYS find something new and some great ideas. My DS is turning 12 in April and it is his year for a party – I can’t wait until he’s back from his bike ride to show him these cakes. PS CONGRATULATIONS on the weight loss. I was thinking about you this morning as it’s Wednesday and I know that is now your “me day”. I was wondering if you’d have a JC appointment scheduled today. 2.3 kg in a week is a great start and you should be very proud of yourself. I had a lot of success with JC after I had my first child (25 YEARS ago), one thing that I always did was that if I went off the program for a day (like your upcoming girl’s weekend) – just make sure that you get right back onto the program afterwards – don’t let one weekend ruin your whole week. Also – I think it’s good to go off the program every once in a while – life happens and it’s no fun if you’re always tied to something. Oh my! I”m actually wondering if my soon-to-be 18 year old might want this for her birthday! I think anybody at any age would want this!! It’s so cool, and a great idea is that you can use anything, another reader suggested jelly beans, that would be awesome!! and smarties on top. I love the Gravity Idea. My son is 11 this month so I might give it a try. Thanks for sharing! 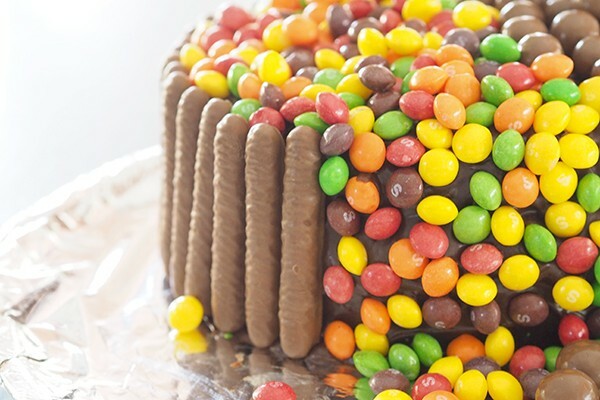 I want to make my son the wild berry skittle with the kit kat on the side but I don’t know how to make it. What size bag to get? Please help me? You can email me if you would like.